Life casting, the art of making molds of body parts, has been around since ancient times. Some of the Roman portrait sculptures from antiquity were based on wax casts taken from the deceased. Many substances can be used to make casts of body parts, such as plaster, silicone, resin and alginate. Alginate, produced from algae, is the easiest choice because it is nontoxic and makes a flexible one-part mold. Prepare your foot for the mold-making process. Shave the hair on your lower leg and foot. Wash the dirt and oils from your foot and dry it thoroughly. Apply a thin coat of petroleum jelly or release agent to your foot to prevent the alginate from sticking to your foot. Pour water into a bucket that is just wide enough to accommodate your foot. Test the temperature of the water and adjust it to match the suggested temperature for the brand of alginate you are using. Do not use water that is hotter than suggested because this will cause the alginate to set more quickly. Conversely, colder water will slow the setting process. You need approximately three parts water to one part alginate, by volume. Pour the alginate into the bucket of water slowly. Keep stirring and continue to add alginate until the ingredients have the consistency of yogurt. 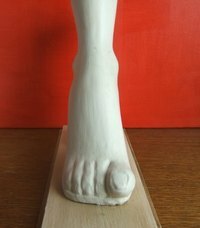 Quickly brush the casting mixture on your foot with the chip brush to capture the most detail. Submerse your foot in the bucket of the alginate blend. Tap the bucket to release any trapped air bubbles. Keep the foot very still. Wait for the mold to set, which generally takes less than 10 minutes. Look at the manufacturer’s guidelines for drying times for your particular product. Begin to wiggle your toes to release them once the alginate mold has set. Gently slip your foot from the mold, being careful to minimize tearing along the top of the mold. Wipe off your foot with a damp towel to remove any traces of alginate. If you want to be able to make multiple casts from your mold, you can make a plaster or wax cast in your alginate mold to use to make a more permanent two-part plaster mold. Make your cast from the alginate mold quickly. Alginate begins to dry out and distort after a few hours. Make sure the casting material you are using is safe for your skin, and always check warning labels.